In the villages of Kutch, tradition is like a seamstress, and an unswerving one at that. It runs between the threads of the warp and the weft going up and down, in and out, hither and thither, giving form to a weaver’s imagination. In this, the humble handloom — a complex and laborious system sustains many artisan families in Bhujodi who live and breathe their craft. One amongst those is Chamanlal Siju, an eleventh-generation artisan and the recipient of the National Award. For Siju and his family it has been their livelihood for as long as they can remember. The ancient relationship between artisans and pastoralists of the Kutch region of Gujarat is a classic example of harmonious coexistence. In the days of yore, vankars or weavers of Bhujodi would make hand-spun blankets for the herdsmen, known as rabaris (the original customers of the artisans), to sheath and protect them out in the open. The blanket was worn either over the shoulder or around the waist over the lungi known as pachedi. Over decades, as the microcosm of the village changed, the shepherds reduced in number but the weavers found more and more demand for their cloth. They expanded their skills to create one-of-a-kind pieces that not only became the identity of their community but also their primary source of income. “I have recently procured centuries-old fabrics and clothes which our forefathers had created. I’m studying and putting them up for display in a permanent exhibit in our village,” says Siju, who doesn’t relate to the modern-day concept of the museum and plans to build an interactive space where craftspeople and enthusiasts can experience the rich history of Bhujodi. Anyone who has ever been to Kutch has witnessed the repository of indigenous arts and crafts that it is today and Bhujodi, a small town just eight kilometres away from Bhuj, is a major textile centre of the district. The village, replete with block-printers, tie-dyers and weavers attracts both local and foreign tourists on a regular basis, and a visit is incomplete without meeting Chamanlal Siju’s family. 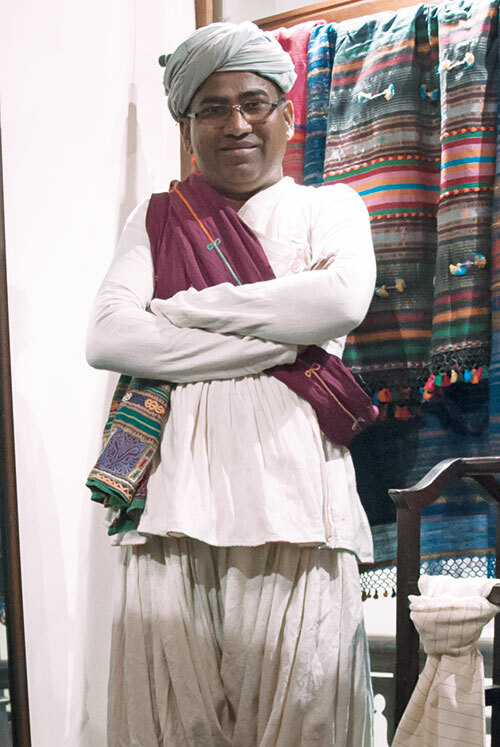 Renowned as specialists in weaving and natural dyeing, Chamanbhai has been trained by his father Premji, who is the recipient of the Shilp Guru Award. What sets this family apart and drives them to be different is their commitment to the innovation and evolution of their work. Often its progression is perceived as an adulteration of authenticity; on the contrary, Siju has received global recognition by doing just that without compromising on originality. The family has bagged government grants for their cultural contribution, while their community has earned the Geographical Indication (GI) status for the Kutch shawl — a milestone that recognises their unparalleled skill and the uniqueness of their work. The USP of their products lies in the fact that a loosely-woven, woollen cloth can provide warmth in the winter and a cooling effect during harsh summers. 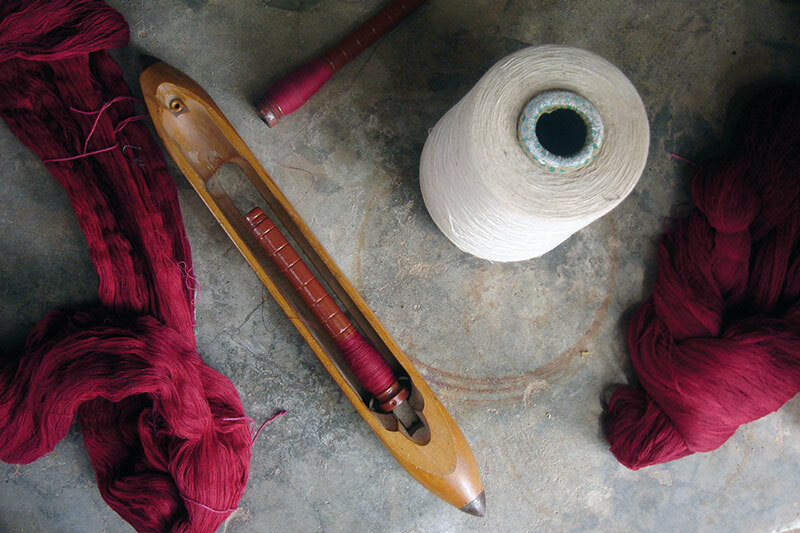 From using sheep and goat wool for veils, shirts, shawls and blankets, to working with various types of cottons, silks, rayons and acrylic yarn, the craft has taken on a drastically new shape but the identity of the products remains unchanged with the use of classic motifs such as vakhiyo, chaumukh, satkani, hathi, dholki…all evocative of rural images created using the extra weft method. 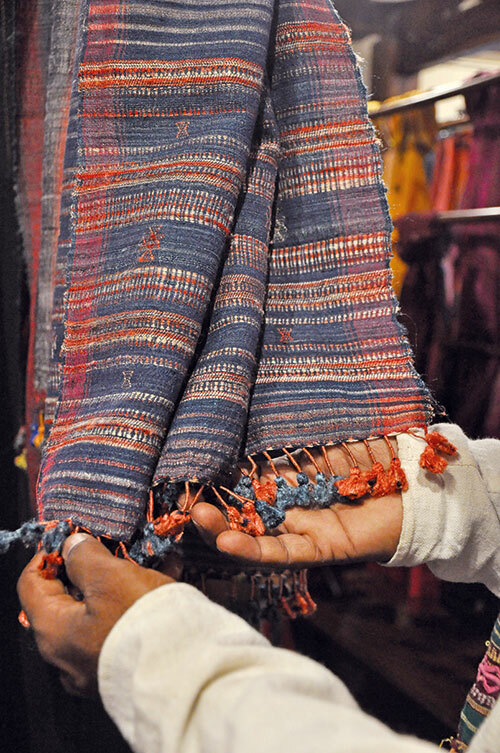 “Weaving is in our blood,” says Siju who talks about his tradition with passion and humility. “Our philosophy is deeply influenced by and linked to Kabir’s songs, poems and spirituality. We believe that work is our meditation, a spiritual practice, like yoga or tapasya. As long as we do it with dedication, we don’t feel the need to visit temples or pray,” he adds. An extension of their lifestyle, the rural society historically conferred symbolic importance on the woven fabric. “Earlier, it was possible to tell which community a person belonged to just from their clothes. Especially with women, one could tell if they were unmarried, married or widowed, from their outfits and the motifs that embellished them. Today, clothes are no longer a marker of our identity or that of our community.” Over the years, Siju has witnessed changes both within his community and in the world outside and has always stood at the forefront to embrace it and change with it. But the future of Kutchi weaves has been floating in a cloud of ambiguity for a long time; as the urban consumer is still unaware and untouched by their beauty and utility. 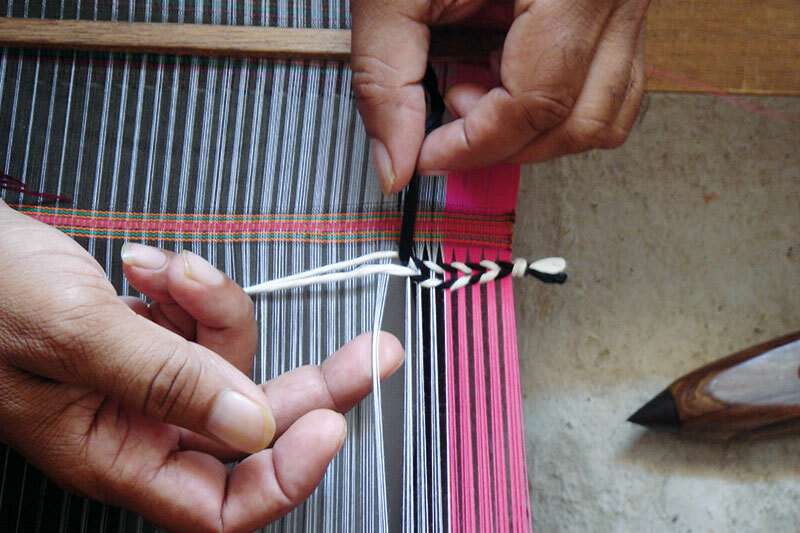 Many established designers have taken an interest in techniques such as Ajrakh and bandhni, but Bhujodi weaving remains the most neglected of the lot. For his Spring/Summer 2016 show, Sanjay Garg worked with Mashru and it was an instant runway hit; Chinar Farooqui has worked with Bhujodi weaves for her home linen line; Aneeth Arora’s collections have been profoundly influenced by Gujarat, her modern spin on the traditional kedia blouse resonated with many; Anavila Misra has created kala cotton saris, while NorBlack NorWhite has done Kutch-inspired separates. Many similar endeavours have been initiated in the past, but few last longer than a season. Though utilitarian is hardly the prettiest appellation, it is central to the charm of this lustrous woven fabric. Therefore, one can’t help but wonder why in a time when more people are turning into vocal propagators of functional fashion, the most comfort-friendly cloth is bearing the brunt of ignorance while other, more decorative ones are flourishing extensively. “Kutch’s intervention may just be three decades old as compared to that of the Benarasi textile, whose history goes back to the 1800s. While that has its Mughal patronage to thank for its longevity and charm, Kutchi weaves are more basic and utilitarian,” explains Parekh. Siju’s family produces some of the finest pieces in the village but they are far from achieving designer status. “When established labels work with craftspeople they always see them as a pair of hands, someone who will execute their vision and not contribute to it. You’ve turned the karigar into a production person who has zero ownership of his work,” she laments. With this central concern, Parekh set out to launch Artisans’ to give them the respect they deserve; providing an alternative to mall-based shopping and global brands that came in after the opening up of our economy. Sitting beside other textiles, such as a close neighbour bandhni, Benarasi or Chanderi, one can’t help but find something missing in this shrinking art. Perhaps we are too rooted in the idea of revival, and are often left with clones of the same product, sifting through shawls and stoles eagerly hoping to be surprised. This is where designers like Aneeth Arora take the lead. 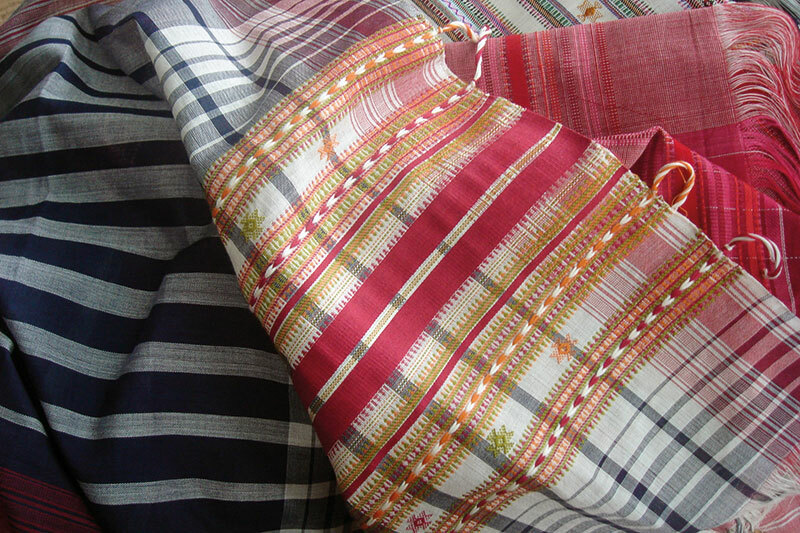 Working with handlooms all along, she creates her own textiles and motifs. But such products — that are authentic, original, international in their appeal and labour-intensive — tend to bite into the realm of luxury because of their steep prices. This makes them available only to some, hence in some way, killing the idea of sustaining the work by making it available to a larger audience. But just as we keep hearing that any craft that doesn’t innovate will soon evaporate, the answer may lie in creating a refreshing, new sartorial language that is still strikingly Indian.